Academy trusts handed cash over a year ago to transform failing schools in the north have yet to take over a single school. Figures obtained by Schools Week show 65 trusts were given a combined £9.5 million to boost standards in northern regions. But documents seen exclusively by the paper reveal more than a third of the 65 have yet to take over a single school – despite being handed £2.7 million between them. By contrast, two trusts in the same time period have taken responsibility for more than ten schools – Astrea, formerly Reach4 (15) and Enquire Learning Trust (11). The northern hub funding formed part of the Conservative party’s “Northern Powerhouse” pledge at the last general election to invest in the north so it could “complement the strength” of London. The funding was given to 65 trusts who, in total, have taken over 141 schools, an average of two each. But 23 have yet to take on any new schools. Some say they do have schools waiting to join from September, while others say they are waiting for the government to line up suitable takeover schools. Meanwhile, a report published last week by the National Foundation for Educational Research (NFER) found the Lancashire and West Yorkshire region – one of the areas targeted under the project – actually had more failing schools than sponsors available to take them over. And the Interserve Academies Trust, which was managing one school in West Yorkshire, has returned the school back to the government, although it received £50,000 for the takeover. 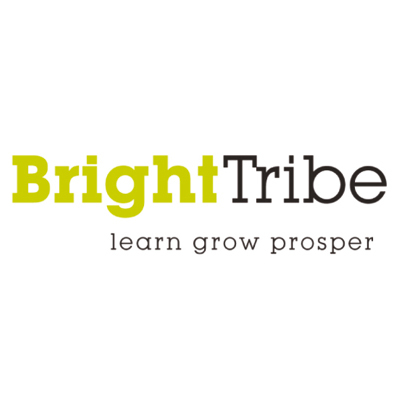 Bright Tribe academy trust was also given just under £1 million to set up an academy hub to boost standards in Northumberland. However, it has not taken over a single school in the region. Angela Rayner, Labour’s shadow secretary of state for education, labelled the “so-called” Northern Powerhouse as “nothing more than hot air” after seeing the figures. She said millions were being given to trusts to support the north, but they were not following through with support. The £10 million funding was announced by chancellor George Osborne in 2014. Grants ranged from £10,000 up to £1.4 million for trusts to take over schools in targeted areas of the north. In November 2015, five trusts were given a share of nearly £5 million to build “academy hubs”. Another funding round in March last year offered trusts up to £100,000 to take over an underperforming school, with an expectation the takeover would be completed by last month. Yet 23 of the paid sponsors are still without any new schools. United Learning, which received £700,000 but so far has opened no further schools, said the cash was used to build capacity, with four schools lined up to join in September. The Darlington-based Carmel Education Trust (£100,000) said it is in talks with three additional schools, and is awaiting more information from the schools commissioners this term. Chris Duckett, a director at Gosforth Federated Academies, which was awarded £100,000 but is yet to take over a school, said Gosforth was committed to evolving carefully without being “predatory”, and had been named as the preferred sponsor for one school, with others keen to join. Brighter Futures, which got nearly £94,000, said it had talked with schools, but none had joined the trust. The money had been spent on activities that included staff training, trust development and legal costs. A spokesperson for Ormiston Academies Trust, paid £72,850, said it hadn’t been “matched” with a school yet, but was committed to expansion. Most of the money had been held back for future projects. Interserve, which gave up Crawshaw Academy, said it would now support local schools as an employability and skills partner. 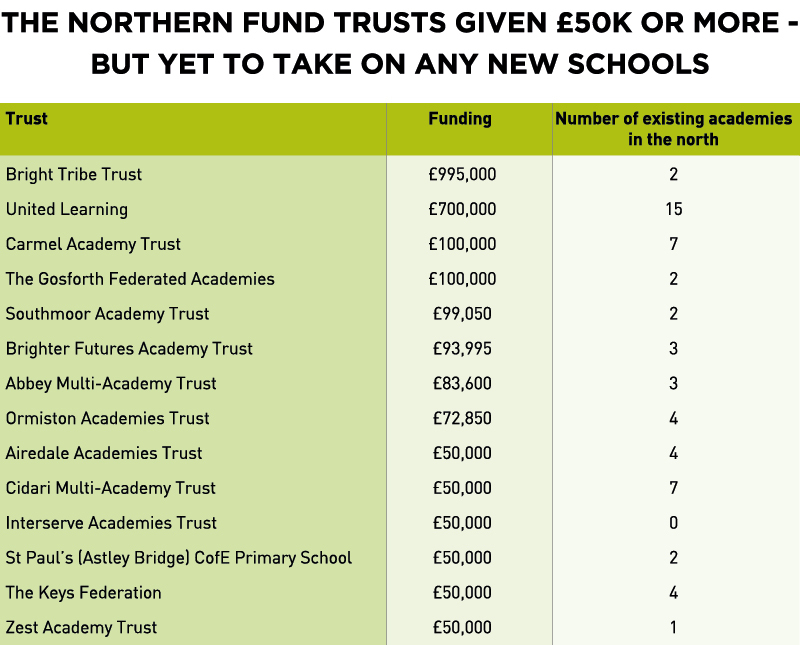 Half of its £50,000 northern funding had been spent, including on a free school application taken forward by others. A trust spokesperson said: “The remaining funds have been returned to the Department for Education”. In a FOI response, the department said progress made by northern fund recipients would be evaluated “in due course”. Funding could be clawed back from any trusts falling “significantly short” of meeting pledges. This would be at the department’s discretion and would be “reviewed in the wider context of the trust’s current status and evidence of progression”. Nearly half the northern funding was handed out to five trusts so they could establish academy hubs in five areas identified for low standards: South Yorkshire, Bradford, Greater Manchester, Northumberland and Tees Valley. Then education secretary Nicky Morgan, speaking in November 2015, said the five trusts were “top performing” sponsors. But what progress have those trusts made nearly 18 months later? The trust was set up as a spin-off of REAch2 after it secured the northern hub funding. It has since taken over 15 schools in South Yorkshire – 13 of them in September last year. Most are primary schools. “deliver on our commitment of an education that inspires beyond measure”. 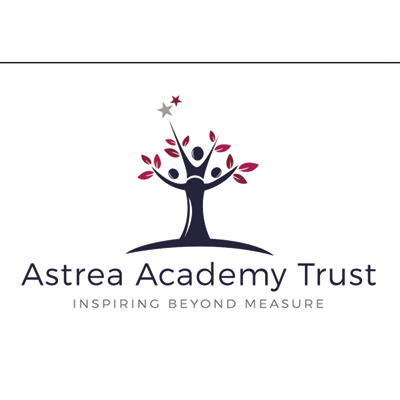 Schools Week revealed earlier this month the trust had been renamed to Astrea, with new members and directors appointed, to mark its independence from founders REAch2. Outwood took over two secondaries in 2015, and four more schools last year – four of which are in Barnsley and Doncaster in South Yorkshire. 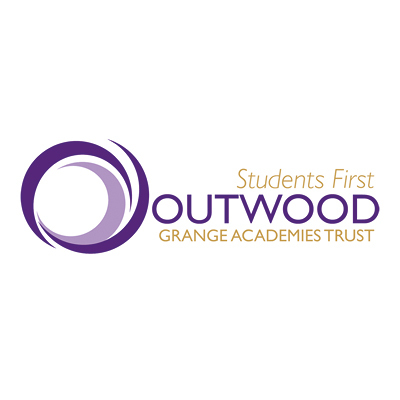 The trust said one of its schools, Outwood Academy Carlton, posted record GCSE results last year, increasing from 29 per cent of pupils getting five A*-C GCSEs, including English and maths, to 64 per cent. The other five schools have either posted or forecasted grade increases. Katy Bradford, chief operating officer, said OGAT had also used the extra funding to run school improvement contracts at two more schools, and provide senior staff on long-term secondments to support the Delta Academies Trust. 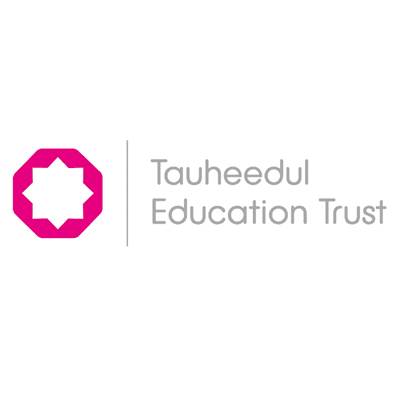 Tauheedul was given cash to open hubs in Greater Manchester and Bradford. Department for Education figures show it has taken over two schools in Bradford, with four in the north west. The trust, which originally ran Islamic faith-based schools only, has since opened a “non-faith division” and plans to expand further. The trust was identified to set up an academy hub in Northumberland. But takeovers for two schools – Haydon Bridge and Haltwhistle – have been held up over complications relating to Haydon’s privately owned boarding wing, Ridley Hall. Northumberland County Council has said the trust is unwilling to take on the lease for the wing. Minutes from a council meeting in January state the delay is resulting in “frustration” for parents and becoming “increasingly demoralising” for staff and students. A Bright Tribe spokesperson said both schools have to come across to the trust as a “cluster”, and said it is working to resolve the issue. The trust is funding a regional team to drive improvement at the schools. The northern hub funding has also been used to complete “considerable” due diligence before the takeovers. A government investigation published last year found Bright Tribe had breached rules over payments to trustees. However, no financial notice to improve was issued. 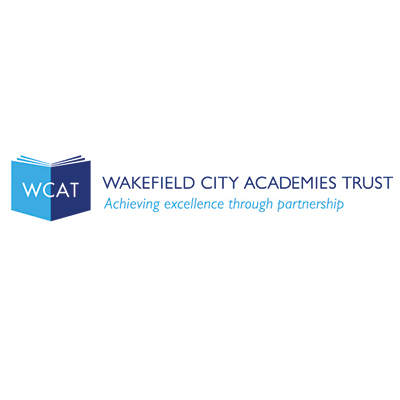 WCAT was due to take over five schools in Bradford, but pulled out of sponsoring two – Hanson School and University Academy Keighley. The trust has not said why it walked away, but said Ofsted documented that improvement support it previously provided at both schools had a “significant impact”. 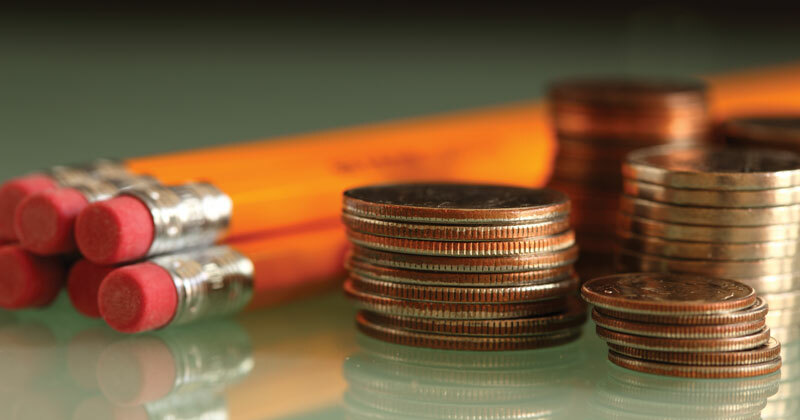 WCAT has faced financial issues, with the Education Funding Agency producing a financial management and governance review that is yet to be published. The trust also breached finance rules over payments to a firm connected to its interim chief executive Mike Ramsay, according to annual accounts for last year. Payments between the trust and Ramsay’s IT firm, Hi Tech Group Limited, rose from £140,605 in 2015 to £295,926 in 2016. Last year’s payments included IT and software development, plus trust adviser and interim chief executive services. But auditors said some of those services were not provided “at cost” and did not follow appropriate procedures as they were approved by a member of staff who reported directly to Ramsay. WCAT said it has tightened procedures to ensure full compliance. The northern hub cash would drive “sustainable improvement” from this year, a spokesperson added. This method for dispensing funds perfectly illustrates how this department functions. Why they did not go through a due diligence process so as to accurately ascertain costs and incentives on a case by case basis is beyond belief. What fool pays upfront for something that is not yet defined or costed? Money is being thrown around like you wouldn’t believe with little thought for taxpayers, auditing, coordination and monitoring, and every thought to push through party political politics at Westminster. Thatcher/Major “trusted” the wealth-makers to be aultruistic in the ’80s to help inner-cities, Blair/Brown deregulated the financial markets in the late ’90s leading to the corruption of banking and a massive deficit, and Cameron/Osbourne oversaw the complete dismantling of: planning laws and destruction of green space infrastructure, local authority education, NHS fragmentation and exit from the EU – and the 3 decade financial penalty that our younger generation “may” pay the tab for. These people are public servants so I would suggest that they might have some decent motives behind their policies? It doesn’t matter really, since schools are so well funded, as the government keeps telling us. Don’t you want strong and stable government? Warning: This statement is potentially ironic.